VP1X & VP1X-ADJ air-powered venturi vacuum pumps are trusted for accurate part placement and rapid part release. 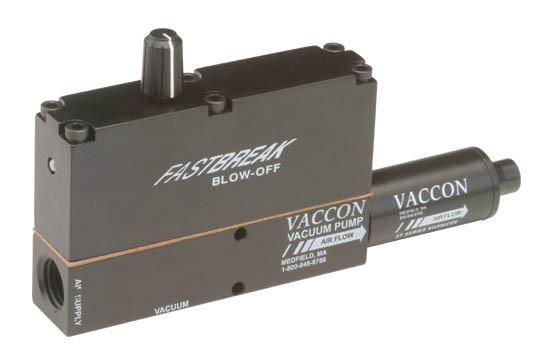 The reliable Fastbreak Mid Series provides both vacuum and blow-off in one compact pump. Only one compressed air line provides both vacuum and blow-off, with no electricity required. The integrated pneumatic high-speed blow off on the VP1X pump provides a fixed-duration blow-off, based on the volume of the housing. With the VP1X-ADJ adjustable vacuum pump, you can control the intensity of the blow-off using one fingertip adjustment knob. (Customer-supplied directional control valve with exhaust required). For applications needing to control the duration of the blow-off, see the VP35 Series page. For applications where you need a solenoid operated pump with a pneumatic blow-off, see the VP2XBV Series Page. Dimensional data for the VP1X & VP1X-ADJ Mid Series venturi vacuum pumps is presented in 2D drawings, with all critical dimensions and port thread sizes displayed. Both imperial and metric units are included. Performance data for the VP1X & VP1X-ADJ Mid Series venturi vacuum pump is displayed, listing air consumption, vacuum flow at various vacuum levels, and evacuation times (for 1 cu. ft. or 1 L volumes). Data is presented in tabular and graphed formats, in both imperial and metric units.